← 2016 Pantone Color(s). YUK or YEAH? 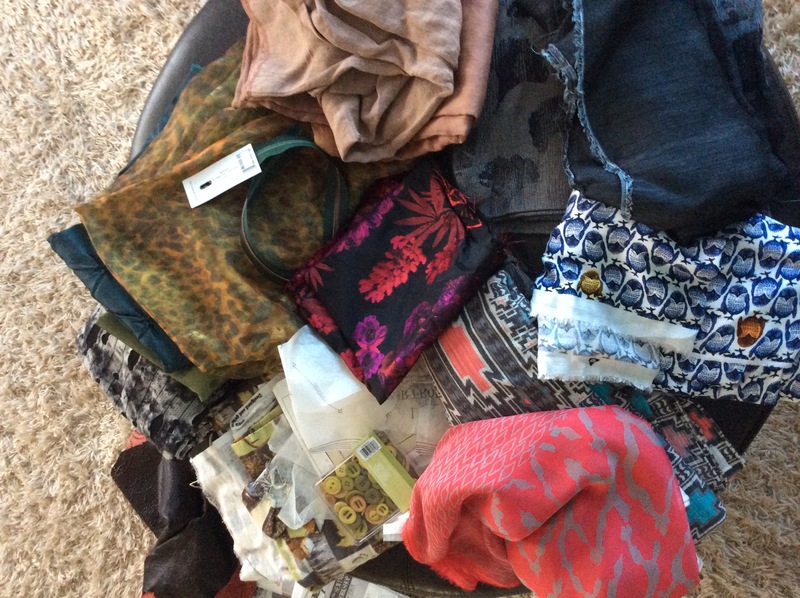 Sewing in Someone Else’s House and a Reversible Leather Vest. Sewing in temporary quarters is a bit of a hassle but it all worked out. One of the bedrooms became the Sewing Room with a small deck table as sewing machine surface. The bed acted as surface display; the kitchen table was the cutting surface. First thing I did was mail order a 18″ X 24″ cutting mat. The small size will now travel with me as it fits flat in the car trunk. Made sure mat was on sale (Joanns), had free shipping, used Ebates, and credit card rewards. That’s known as stacking. Ebate Full Disclosure: Clicking on the Ebates link will take you to Ebates website where you can sign up for your own account. Once you make a purchase, I receive a bonus. 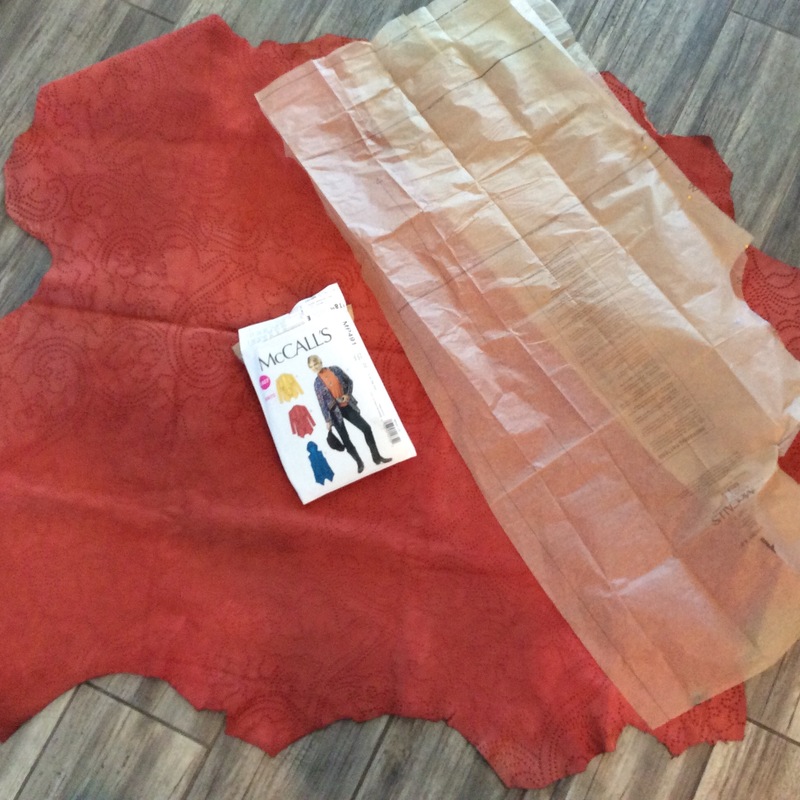 And the first project– the perforated leather lamb skin purchased June 2015 at Fabric Outlet in SF. The perforated paisley design and the suppleness are very appealing. Here is an interesting blog on Fashion Trends, specifically, Perforated Fabric, from well-suited at Studio Faro in NSW. This is a double-sided skin–smooth brown reversing to a deep peach suede which has also been perforated with a paisley design. It was pricey so only bought one skin, plus, leather is bulky and heavy to pack home. 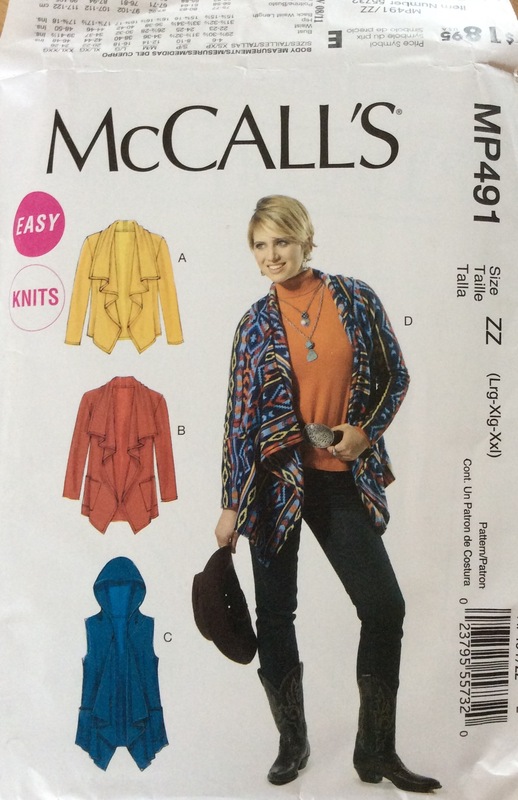 To make use of both sides, I chose McCalls MP491 (OOP), view A minus the sleeves. Opened the pattern and knew right away this wasn’t going to work. In my wildest dreams, how could I cut this vest out of one skin????? That is only one of three pattern pieces. HELP!!!!! The skin and pattern were on the kitchen table for several days as I pondered and puzzled. It all came together when I needed to supervise the Maintenance Guy as he downloaded a complete (vs incomplete) cable channel lineup. Hey, DIY and HGTV are great background noise for sewing. The AhHa moment came when I accepted that the pattern as is wouldn’t fit, BUT, would by shortening length. Laid front(s) and back to take advantage of irregular skin edge as hem and front edges. Front drape is generous so extended pattern beyond edge of skin to get room for all three sections. Heck Yes, I can get a vest out of one skin! At the top is the back (upside down); fronts are at the bottom. Couldn’t do a ‘with nap’ layout but will need to live with it. Anyway, nap changes at shoulder and may never even wear with suede side out. 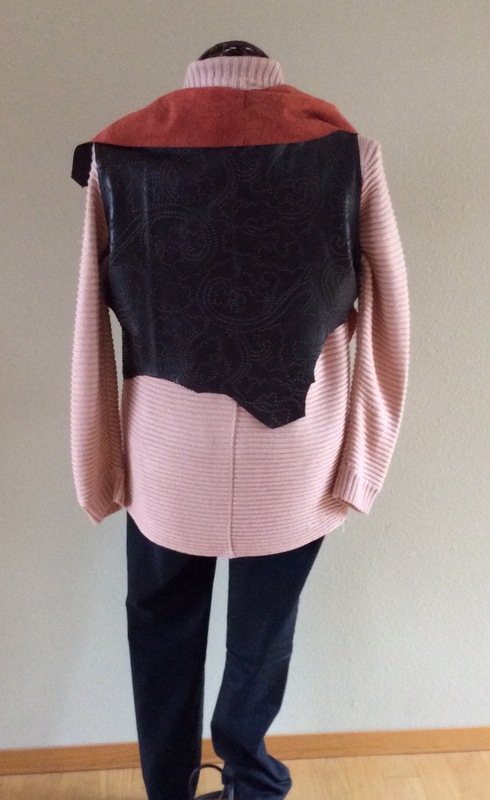 Decided to do lapped seams– front over back. Measured seam allowances and hashed those to be removed when cutting out. 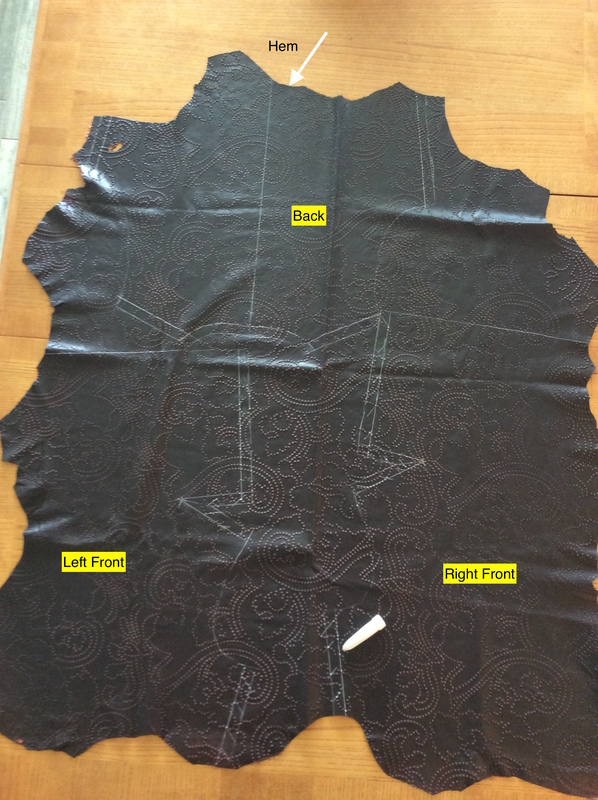 Seam allowance lines on back are guide lines for the front seam lap. Note: side seams are not equal but will work, trust me. 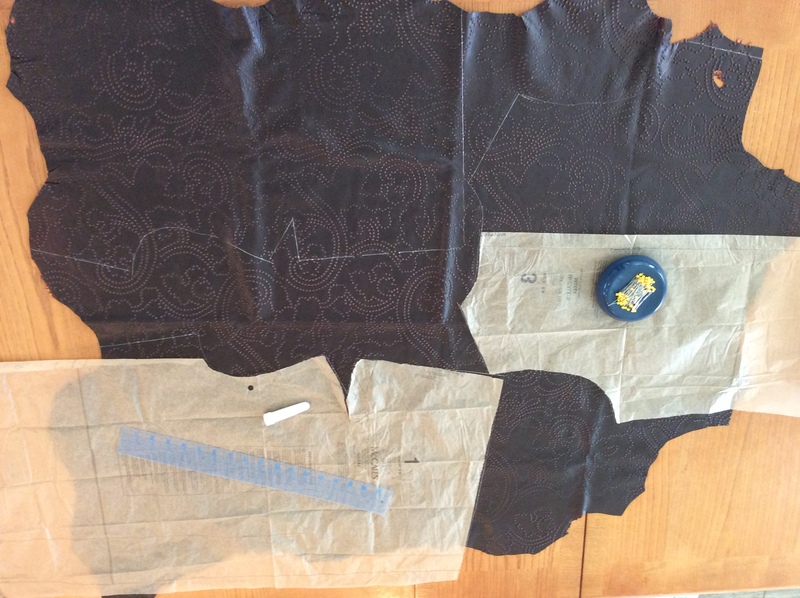 Once cut out, sewing was a breeze. Used a leather needle and walking foot to stitch two rows about 1/4″ apart on lapped seam. Glued the seams in place before stitching. Underarm and shoulder seams are lapped front over back. Collar seam is lapped over back. 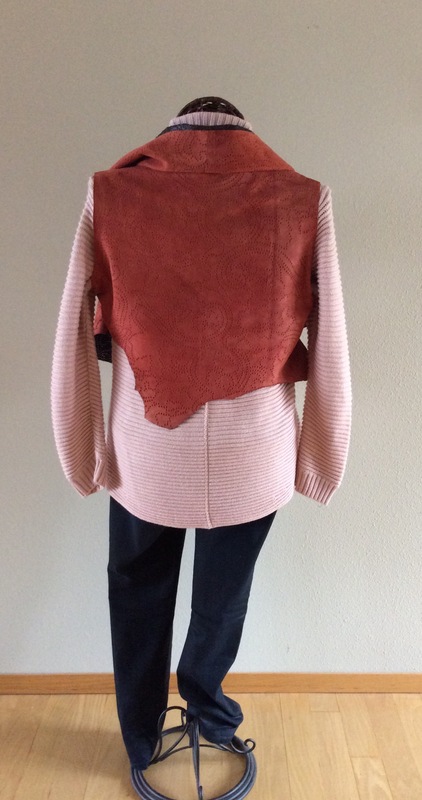 Here it is, a fun reversible leather vest. 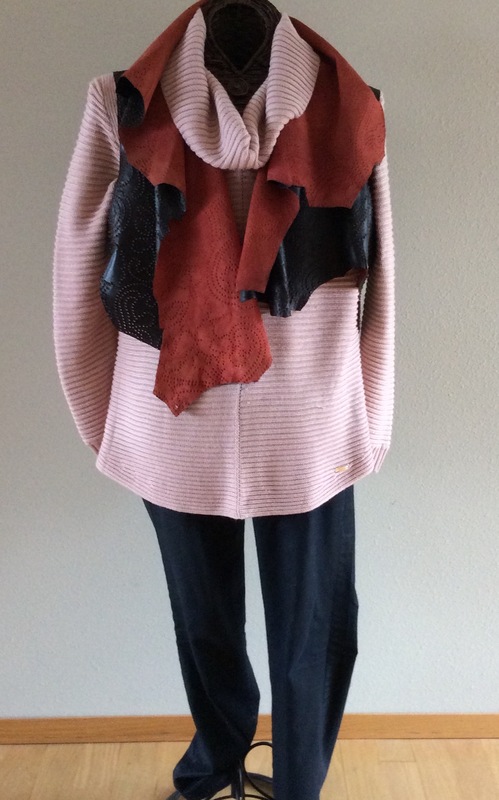 This entry was posted in FIBER FASHION FUN and tagged double-sided, ebates, lapped seams, leather, leather needle, McCalls MP491, Perforated, reversible leather vest, walking foot. Bookmark the permalink. Thank you Anita; this is high praise from someone whose fashion/sewing acumen is admired.